Christo Bottling Co., Washington D.C. The Christo Bottling Company was in operation from 1917 to 1927. It’s primary founder was Herbert Guggenheim, who, according to 1920 census records, was born in 1886 and a native of Washington D.C.
Beginning in 1907 and up through 1911 he was listed in the Washington D.C. directories as a “wholesale liquor” dealer with an address of 1636 9th Street, nw. 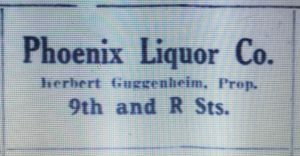 The directory listings did not associate him with a specific company but a newspaper advertisement printed in the January 1, 1910 edition of the Washington Times called his business the Phoenix Liquor Company. 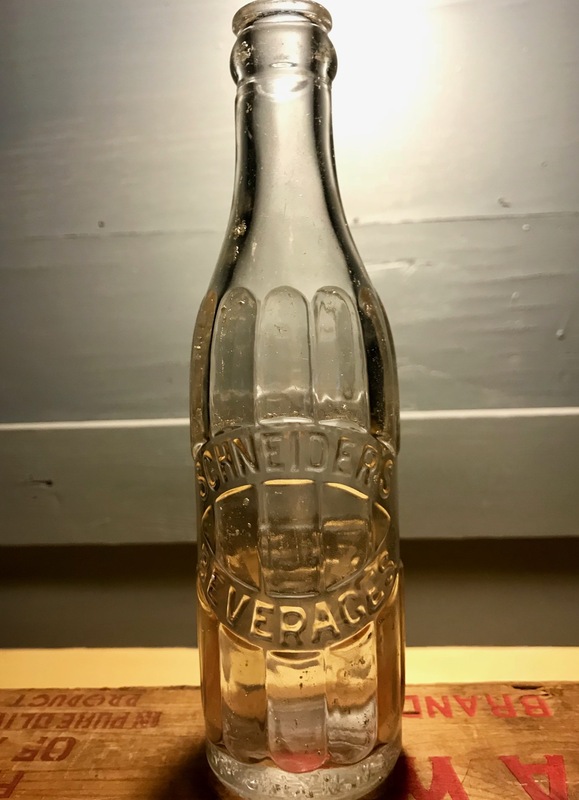 Between 1912 and 1917 Guggenheim was listed as a “salesman” or sometimes “solicitor,” and then, sometime in 1917, he partnered with Sydney E. Gunst and established the Christo Bottling Company. The 1918 and 1919 Washington D.C directories listed their business address as 931 C Street, nw, with both Gunst and Guggenheim named as proprietors. In 1920 Gunst was no longer included in the listing, apparently retired. The business remained at the C Street location until 1924 at which time it was listed at 209-11 11th Street, nw., where it remained through 1927. Primarily operated during the prohibition years, the business dealt in non-alcoholic beverages. 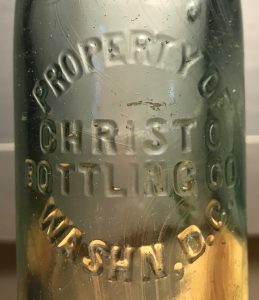 They apparently served as a local agent for the Richmond, Virginia based Christo Manufacturing Company, bottling and distributing Cristo-Cola and Cristo Ginger Ale. In addition, they must have held contracts with other beverage companies as well. 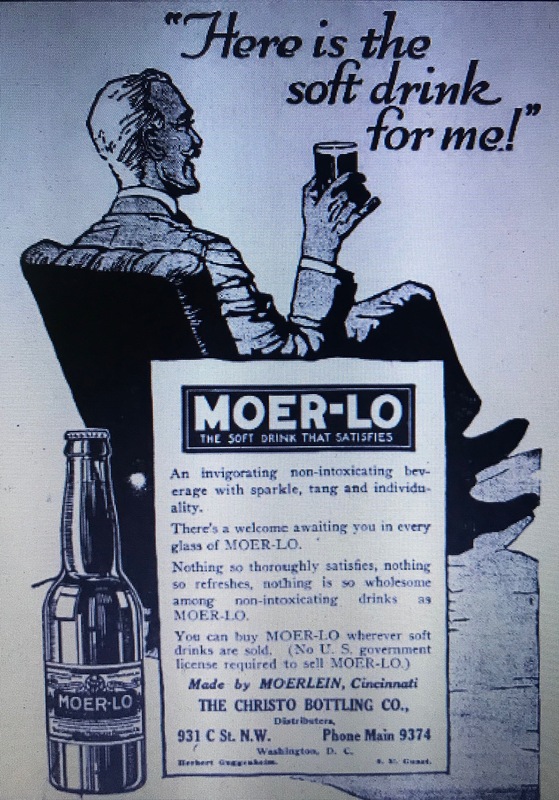 This advertisement, printed in the November 20, 1917 edition of the (Washington D.C.) Evening Star, named the Christo Bottling Co. as a distributor for “Moer-Lo,” a beverage manufactured by a company named Moerlein of Cincinnati, Ohio. An invigorating and non-intoxicating beverage with sparkle, tang and individuality. There’s no record of the G & G Bottling Company that I can find in either the Washington D. C. general or business directories so it appears that the company existed in name only. 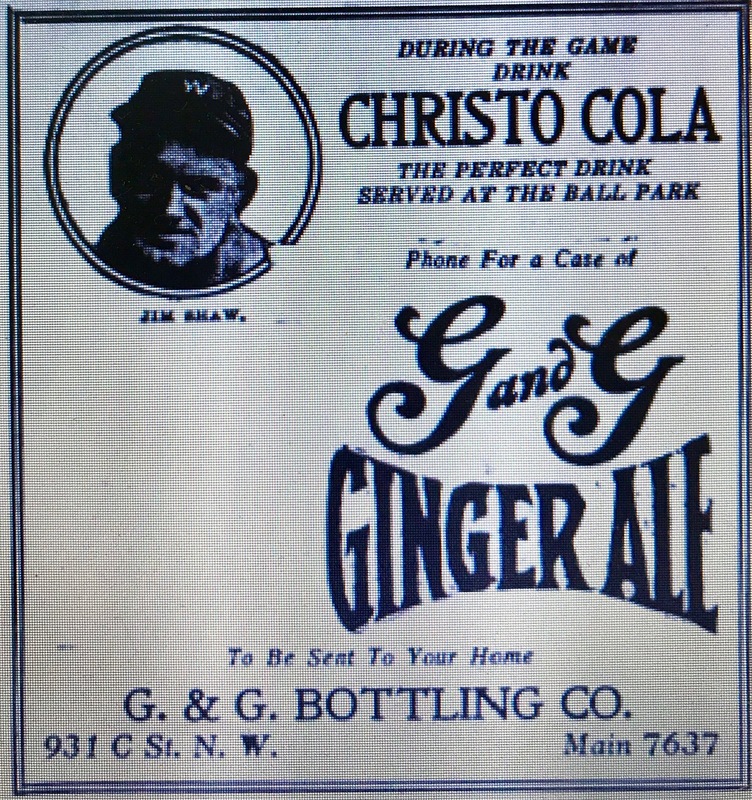 This is supported by an advertisement for G & G Ginger Ale in the April 21, 1921 edition of the Washington Times in which the G & G Bottling Company used the Christo Bottling Company’s C Street address. Not surprisingly, in a decision dated January 4, 1926, the Washington D.C. Court of Appeals found in favor of Cantrell & Cochrane. G & G more nearly approximates C & C both in appearance and sound, than any other two letters, and their continued use inevitably would result in the reaping by the defendant of the benefits incident to the long established and widely advertised business of the plaintiff. The decree is affirmed, with costs. The Christo Bottling Company was not listed in the 1928 directory but Guggenheim was; as the proprietor of the Guggenheim Company, a bottling business located at 3301 K Street, nw. Whether or not this change in company name was related to the court case is not clear. The Guggenheim Company remained listed through 1934, always at the K Street address. The bottle I found is a 7 1/2 ounce machine made bottle that dates to the 1917 to 1927 time frame of the company. It’s a good guess that it either contained Christo-Cola or Ginger Ale. How and why it ended up on Long Island…who knows? The initial proprietors of the business were John Bolen and John Byrne. 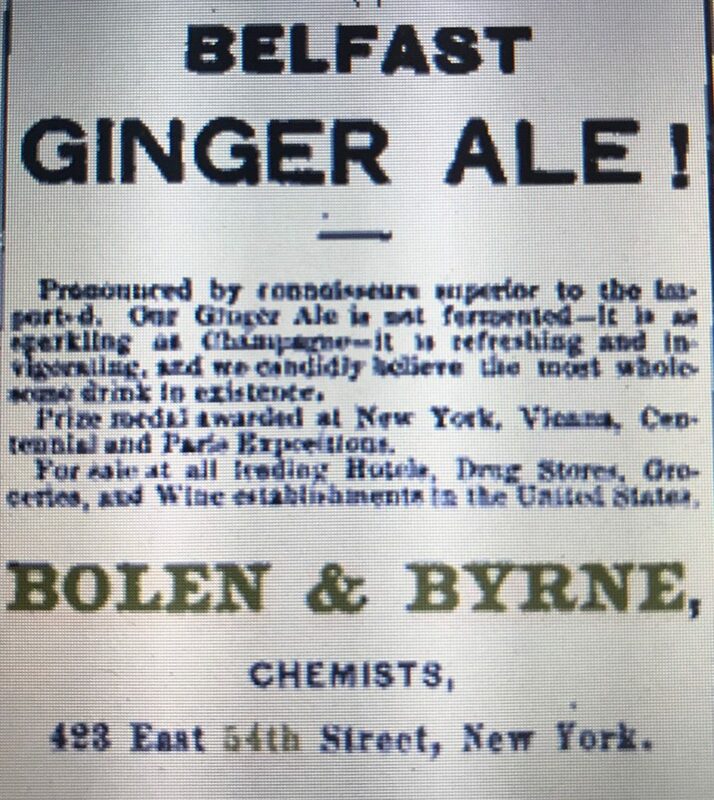 The “History” section of corporate documents, prepared in 1929, stated that the original partnership of Bolen & Byrne was established in 1857 and that they were the first manufacturers of ginger ale in America. The first listing I can find for the business is 10 years later, in the 1867-68 NYC Directory, listed as soda and located at 235 East 28th Street. Census records show that John Bolen was born in 1840 and would have only been 17 years old in 1857 so while it’s possible that he established the business at this young age, I’m leaning toward a start date closer to 1867 based on this initial listing. The business remained at East 28th Street through 1877. Over this period they listed themselves in the directories as either chemists, soda or waters. This is confirmed by a company receipt from 1875 that was listed on e-bay. The receipt listed their address as 220, 231 and 233 East 28th Street. It also names them as the proprietors of the American Mineral Water Co., located on President Street in Brooklyn. I can’t find any mention of the American Mineral Water Co., or Bolen & Byrne in the late 1870’s Brooklyn Directories. It’s possible that this may have been their factory location but who knows? Around 1879 Bolen & Byrne moved from East 28th Street to 415 East 54th Street where they remained listed through 1902. Both Bolen and Byrne were also listed individually at this location until 1893, when Byrne’s listing disappeared. Most likely, he either passed away or left the business around this time. During this time the business also maintained a Philadelphia location. 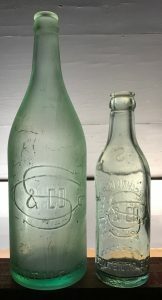 They were listed in the Philadelphia City Directories between 1888 and 1896 as bottlers located at 813 North 11th Street. My concern, Bolen & Byrne, is the most extensive in this country. We have over 200 hands employed in our two establishments in New York and Philadelphia. It looks like the business formed a New York Corporation in the late 1800’s. In 1898, the business was listed for the first time as Bolen & Byrne Mfg. Co. (NY). John Bolen was listed as President and his son, John K. Bolen as secretary up until 1902. After this it appears that both father and son disassociated themselves from the company. In 1904, Bolen & Byrne moved to 514 West 36th Street with Abraham Karlsson named as president. The carbonated beverage firm of S.A.Ludin operating under the registered trade name of New York Bottling Co. was also listed at that address and it appears that they merged or at least formed an association with Bolen & Byrne. Although listed separately in the NYC directories, they advertised together quite a bit. The advertisement below is from the December, 1907 issue of the Druggist Circular. S.A.Ludin, New York Bottling and Bolen & Byrne are all listed with the same 36th Street address through 1915. In late 1914, five New York bottling firms, including S.A. Ludin consolidated into a new corporation called the New York Bottling Co., Inc. Neither Bolen & Byrne or S.A. Ladin were listed in the 1916 directory. I believe that Bolen & Byrne was included with S.A.Ludin as part of the consolidation but I can’t prove it. Pronounced by connoisseurs superior to the imported. Our Ginger Ale is not fermented – it is as sparkling as champagne – It is refreshing and invigorating, and we candidly believe the most wholesome drink in existence. Prize medal awarded at New York, Vienna, Centennial and Paris Expositions. For sale at all leading Hotels, Drug Stores, Groceries and Wine establishments in the United States. This infringement was not confined to a mere timid attempt or colorable imitation of Messrs. Cantrell & Cochrane’s packaging, but was as close and elaborate copy of the original bottles, labels, corks, etc., as could be executed. 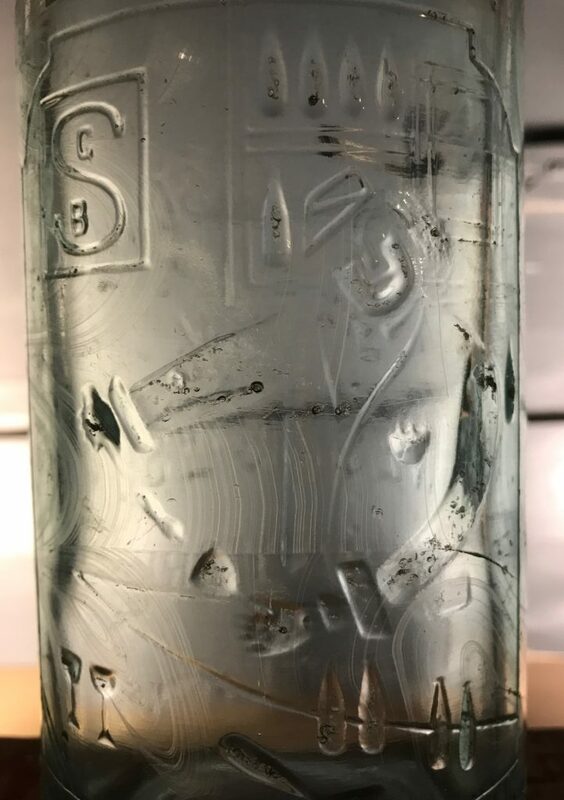 Bolen and Byrne went so far as to have the words Dublin and Belfast stamped or blown on the rounded bottoms of their bottles, regardless of the fact that they had no facilities whatsoever overseas. Prior to March last the defendants were all employed by the plaintiff (Bolen & Byrne) or its predecessors, in various capacities, for periods ranging from 13 to 30 years. Shortly before April last, the defendants apparently by common consent, all left employment of the plaintiff, and a few weeks afterwards united in the business of manufacturing goods of the same kind as those made by the plaintiff. In putting their goods upon the market, the defendants adopted labels for their goods which the plaintiff alleges are imitations of his labels. In this instance, Bolen and Byrne prevailed. On January 14, 1929, a corporation called the Bolen & Byrne Beverage Corporation, incorporated under Delaware laws, was registered with New York State as a foreign business corporation. Documents associated with their stock offering published in the January 29, 1929 issue of the Brooklyn Daily Eagle stated that the new corporation was a successor to the original partnership of Bolen & Byrne, established in 1857. It went on to say that its president, Ehler Meyer, was a descendant of the founders (but they don’t say which one). The document also stated that the corporation will own all the stock of both the Orange Crush Bottling Company of New York and the Piping Rock Corporation of New Jersey. Other than reviving the name “Bolen & Byrne” I don’t see much of a connection between this corporation and the original business. As best I can tell, today, the Bolen & Byrne Beverage Corporation is still an active corporation registered with the NYS Department of State. However, their last listed address of 502-04 West 45th Street is currently a Hess Gas Station. So who knows?. The bottle I found is mouth blown with an applied lip. It has a rounded bottom and is embossed Bolen & Byrne, New York. There’s no mention of Dublin and Belfast. It was probably manufactured in the 1880’s, after they moved to East 54th Street. L. Steinberger, 496 to 502 Pavonia Ave., Jersey City, N.J. The L stands for Louis Steinberger. His business was listed in every Jersey City directory I can find between 1883 and 1925. The directories listed his occupation as either mineral water or soda with an address of anywhere between 496 and 502 Pavonia Avenue. According to his obituary in the March 14, 1933 issue of the Plainfield N.J. Courier News, he served as president of the Steinberger Beverage Company up until his death in 1933. The February 15, 1904 Issue of the American Carbonator and American Bottler referenced him as a manufacturer of all kinds of mineral waters, root beer in fountains, fruit syrups and extracts. He apparently was the local bottler for regional/national brands as well. The American Carbonator item stated that he was the sole agent in Jersey City for Sheboygan Mineral Water and he was the local Jersey City bottler for Ward’s “Orange (and Lemon) Crush.” This is confirmed in several “Orange Crush” advertisements printed in the “Brooklyn Daily Eagle” between June and August of 1920. Apparently his directory advertisements didn’t change much over the years. The advertisement on the right is from the 1893 directory, the one on the right is from 1922. The business appeared to be a small, family run affair. Some directories listed Louis’s residence as 502 Pavonia Avenue with the business address at 496 or 498 Pavonia Avenue. So he probably lived adjacent to the business. The 1910 census records listed Louis’s occupation as the proprietor of a mineral water manufacturing business. His sons Louis Jr. and Claude were listed as superintendent and wagon driver respectively. By 1920, Louis Jr.’s occupation was listed as “manager, soda factory” and Claude was “salesman, soda company,” but it wasn’t until 1925 that the sons were reflected in their Jersey City directory advertisements. The business continued into the late 1930’s and possibly early 1940’s. The 1930 and 1940 census records listed Claude as “treasurer, beverage industry” and “salesman, beverage manufacturer” respectively. In addition, advertisements for Steinberger Beverages were prevalent from 1934 to 1936 in the Courier News. 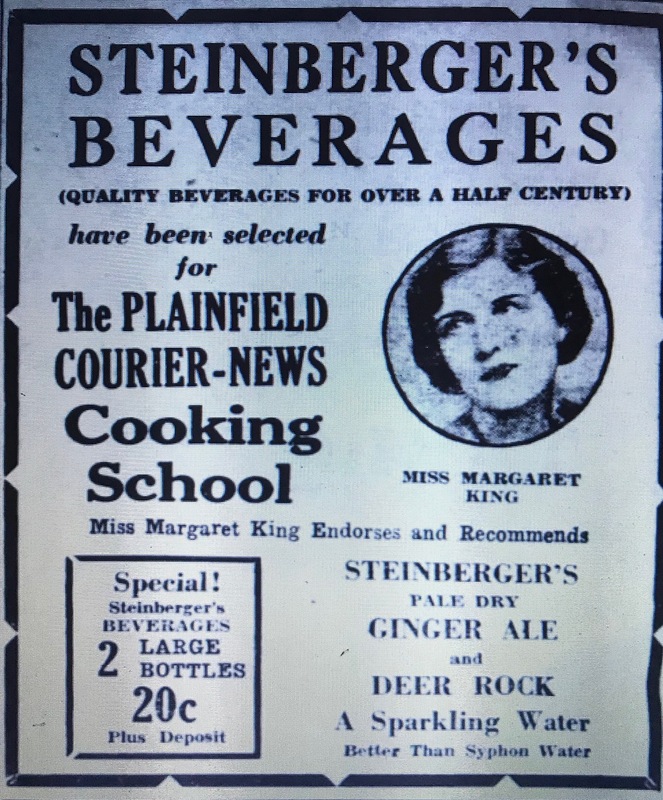 Most involved Steinberger Beverages association with the Plainfield Courier-News Cooking School. 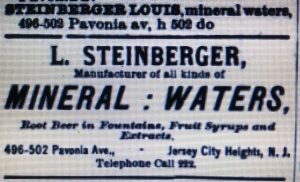 The end date of the business is not clear, but I don’t see any advertisements for Steinberger Beverages in the 1940’s. According to Zillow.com, 502 Pavonia Avenue is a single family home built in 1877. This fits with the directories that list 502 Pavonia as Louis Steinberger’s residence. Today, the building at 496 Pavonia Avenue appears to be a renovated four-story walk-up that’s been converted to apartments. It could also date back to the business. 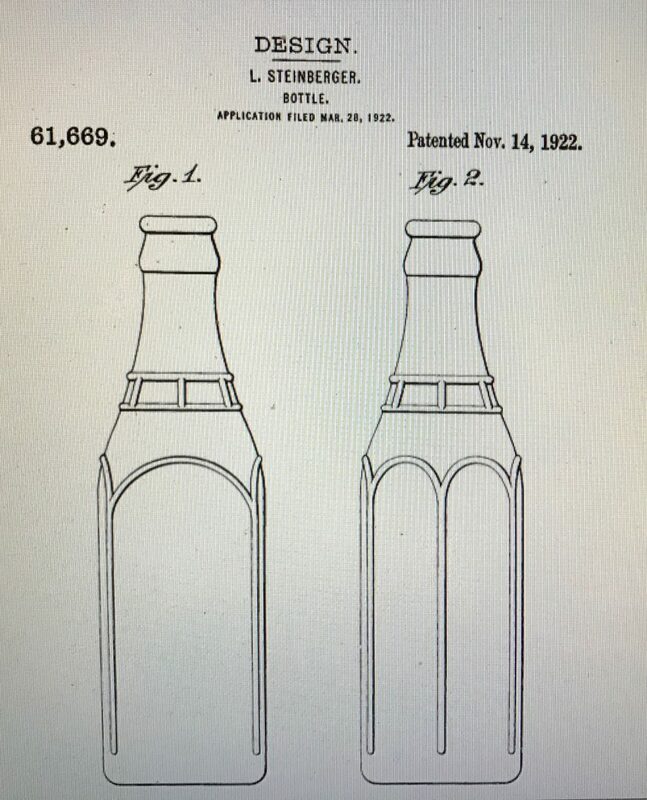 The bottle I found is machine made and similar in design to the patented design although it’s missing the double ring at the base of the neck that’s shown on the plans. Steinberger also obtained a patent for the trademark “With The Taste That Tempts.” Trademark 210,660 was registered on March 16, 1926 but the documents indicate that it had been continuously used in the business since January 15, 1915. Note that the phrase was used in the 1925 advertisement shown above. 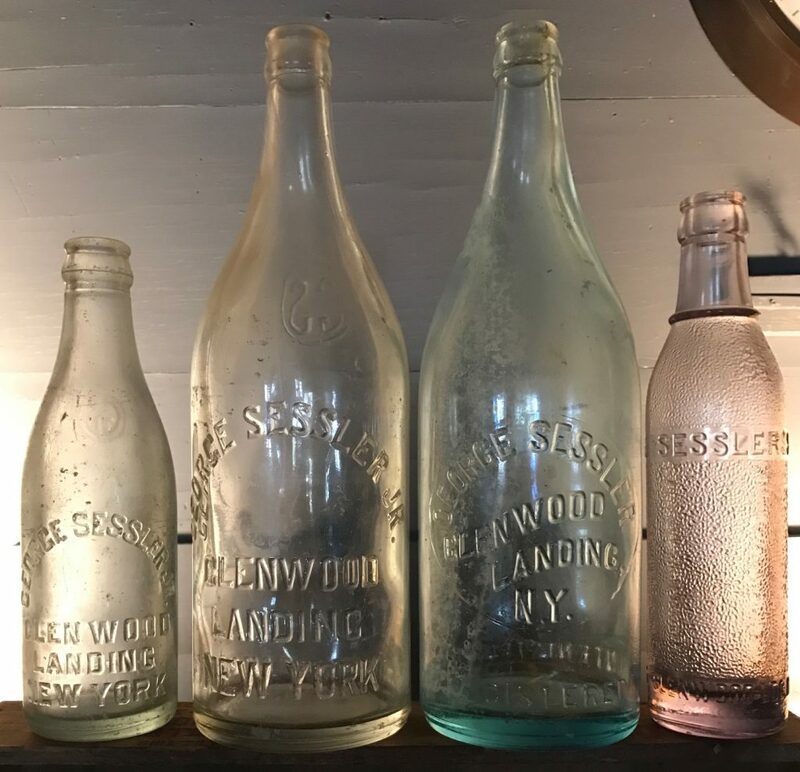 George Sessler, Glenwood Landing, N.Y.
Sessler was elected “a member at large” of the American Bottler in 1907, so it appears the business started sometime between 1900 and 1907. The business listed their address as “Highway, Glen Head Depot to Shore” in the Annual Report of the State Commission of Excise in 1913, 1915,1918 and 1919. This location appears to be the same as the house address Sessler listed in 1920 and 1930 census records, further indication that it was a small family run business. In 1920 and 1930, George continued to list mineral water manufacturer as an occupation and Adolph listed his as mineral water salesman. So the business must have continued at least into the early 1930’s. I was able to find two newspaper advertisements. 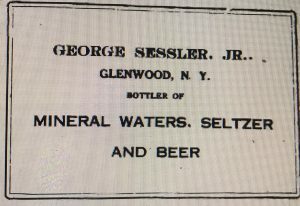 One in a May 1918 issue of the “Sea Cliff News” stated Sessler was a bottler of mineral waters, seltzer and beer. 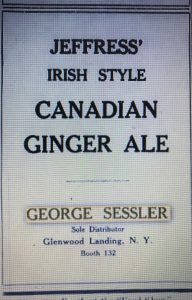 The other was in the March 4, 1923 issue of the “Brooklyn Daily Eagle” and it announced that he was the sole distributor of Jeffress Irish Style Canadian Ginger Ale. George Sessler passed away on September 29, 1933 at the age of 60. Adolph continued to list his occupation as mineral water salesman in the 1940 census records but it’s not clear whether or not he continued the family business or worked for another company at that point. I found 4 bottles, all different (7oz, 8oz, 27 oz and 28 oz) and all machine made. Three are embossed George Sessler or George Sessler Jr and one is embossed Sessler’s Beverages. Recognizing the change in name, this last one may have been manufactured after George’s death in 1933. All of them are embossed with the Glenwood Landing location. Author baybottlPosted on October 28, 2016 January 25, 2019 Categories Beer, Mineral Water and SodaTags ABM, antique bottle, ginger ale, Oyster Bay L.I. Early company advertisements stated that the business was established in 1857 by Gilliam B Seely. It first appeared in the 1859 NYC directory, listed as soda water and located at 80 Commerce Street. In 1884, the business moved to 319 West 15th Street where it remained listed through the late 1920’s. A company advertisement in the 1884 directory stated that they were manufacturers and bottlers of soda water, sarsaparilla, ginger ale and root & raspberry beer. It is apparent that Gilliam’s son, Frank, took charge of the company in the late 1880’s. The company name was listed as G.B Seely & Son in the 1887 and 1888 directories. Then in 1889 the company name listed in the directory changed again, this time to G.B. Sealy’s Son. Frank Seely is the only company principal named in the NYC Copartnership and Corporation Directory in 1890. It’s not clear whether Gilliam retired or died but he was no longer listed in the NYC directories. According to the Annual Report of the Factory Inspectors of the State of New York, in the year ending November 30, 1899 G B Seely’s Son had 50 male employees working a 60 hour week . The business was listed as a New York Corporation for the first time in the 1914 Copartnership and Corporation Directory. Frank Seely was listed as President, Hugo Eiche as Secretary and Carl Klingelhoeffer as Treasurer with a capital of $200,000. 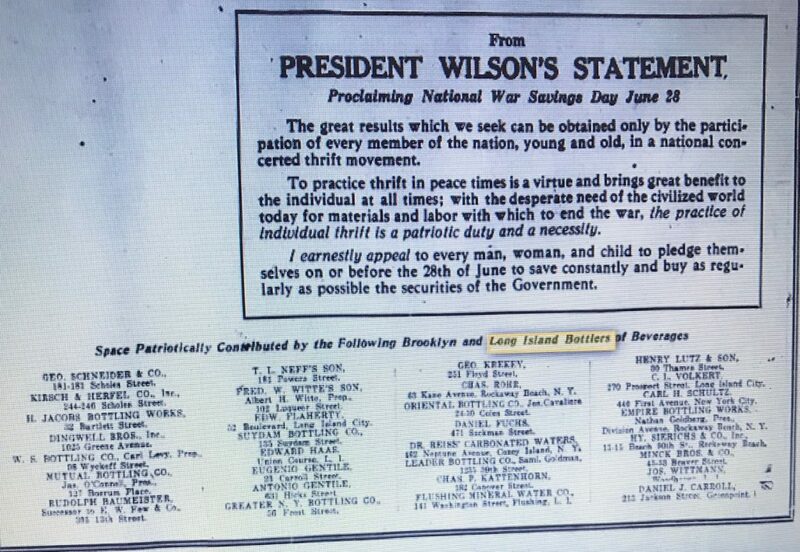 In 1919, Hattie Seely was listed as president and Frank was not mentioned. 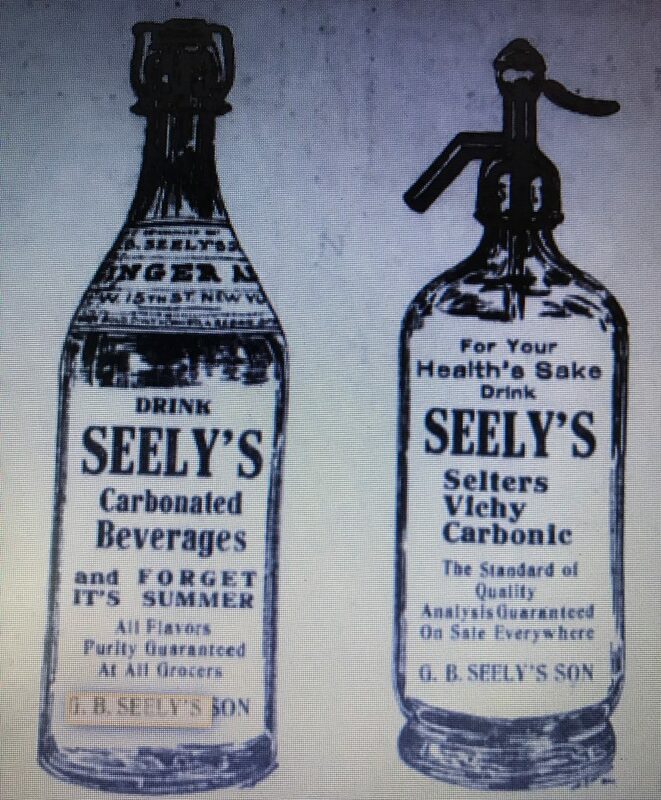 One of the many attractive booths at the Pure Food Show, which is being held in Prospect Hall is that of G B Seely’s Sons, dealers in carbonated beverages. Harry Coll and James Morgan are in charge of this booth and are prepared at all times to serve soft drinks to everyone attending th show. The Seely exhibit is one of the best in the entire show and well merits the praise which has been bestowed upon it. The list of beverages exhibited comprises ginger ale, sarsaparilla, lemon soda, cream soda, root beer, birch beer, orange phosphate and raspberry soda. June 25,1928 New York. Directors of Canada Dry Ginger Ale today voted to offer stockholders the right to subscribe to new stock at $60 a share on the basis of one new share for every ten held at present. The funds raised will be used to acquire G.B. Seely’s Son, Inc…the purchase price has not been announced. Canada Dry was still using the Seely name in advertisements in 1929: “Seely’s Delicious Beverages, incorporated, owned and operated by Canada Dry.” Around this time they moved from their long time W 15th Street address to 625 W 54th Street but continued to be listed separately in the NYC Directories through at least 1932. 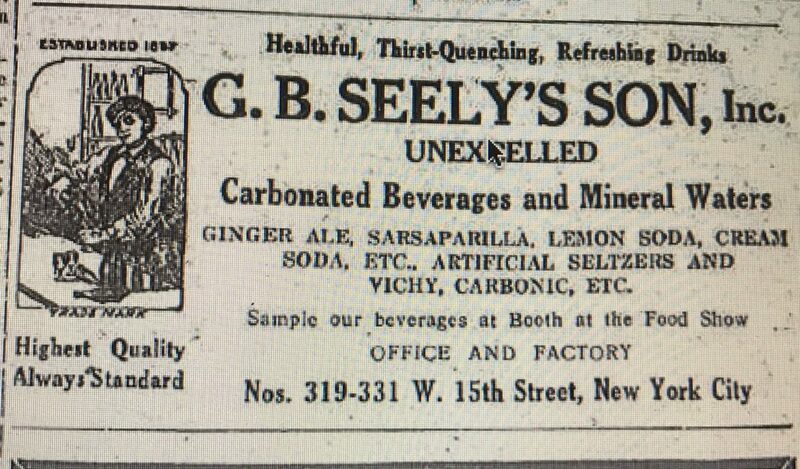 It’s not clear when Canada Dry dropped the Seely name. Today the West 15th Street addresses are incorporated in a large 20th century apartment building. The bottle I found is machine made (28 oz) with the “Inc” embossed after the name, which puts it in the vicinity of 1914 or later. The back of the bottle is embossed with their trademark picture of a bartender pouring drinks. Frank Seely filed the trademark application on July 11, 1905 (No. 10,063). In the application he stated that it had been in use since 1870. According to the 1900 census records, George Schneider, founder of Geo Schneider & Co., was born in Germany and immigrated to the United States in 1889 at the age of 12. A native of Germany, Mr. Schneider came to this country as a young man and started his beverage concern 40 years ago. From a small beginning the firm expanded several times and now occupies a large plant at the Stockholm Street address. The first time he appears in the Brooklyn City Directories was in 1902 with the occupation “waters” and a home listing of 1465 Dekalb Avenue. He was also listed in the 1903 Trow Business directory of Brooklyn under “mineral water” at 1465 DeKalb. In the 1906 Brooklyn City Directory he’s listed for the first time at 181-183 Stockholm. The business remained listed at that address into the 1960’s. The Mineral Water Establishment of Geo Schneider & Co, 183 Stockholm St, Brooklyn, burned on Friday July 30. Seven horses perished and an automobile fell prey to the flames. Damage about $ 5,000. Not insured. Geo Schneider was one of many Brooklyn and Long Island Bottlers of Beverages that “patriotically contributed” advertising space in the June 27, 1918 edition of the “Brooklyn Daily Eagle” that contained a plea from Uncle Sam to Brooklynites to sign a pledge card to purchase war savings stamps to fund the war effort. A 1922 advertisement In the Brooklyn Eagle stated that they were “manufacturers of Hygienic Ginger Ale” and in a December 31, 1938 advertisement wishing “seasons greetings” to friends and patrons they called themselves “The Ginger Ale House of Brooklyn.” By this time they had apparently bought the adjacent building and were listing their address as 171-183 Stockholm Street. The management of the company after Schneider’s death in 1939 is not clear but through the 1950’s the business was quite innovative. One of their advertisements from the early 1950’s touted diet soda decades before it became fashionable. 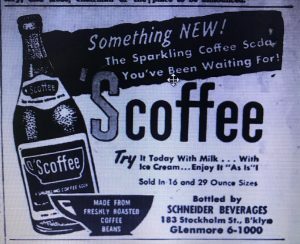 Another advertised a coffee flavored soda. Today, 177 Stockholm Street includes several attached (common wall) buildings that could have been used by the business. Although the business spanned the transition from mouth blown to machine made bottles, I’ve only found machine made ones (a 27 oz and an 8 oz). I’ve seen mouth blown examples on the Internet. 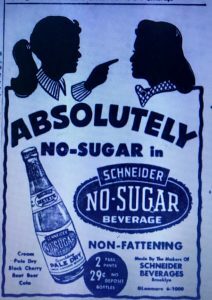 I’ve also found an example made later embossed simply Schneider Beverages. The Illinois Glass maker’s mark on the base indicates it was manufactured in 1931. 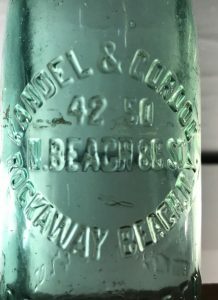 Kandel & Gordon, 42-50 N. Beach 86th St., Rockaway Beach, N.Y.
Harry Kandel and Harry Gordon were successors to George Bennett’s long time Far Rockaway soda business (1877 to 1920). The following article appeared in the April 8, 1920 edition of the Wave. It appears introductory in nature and implies that this would be their first summer season. 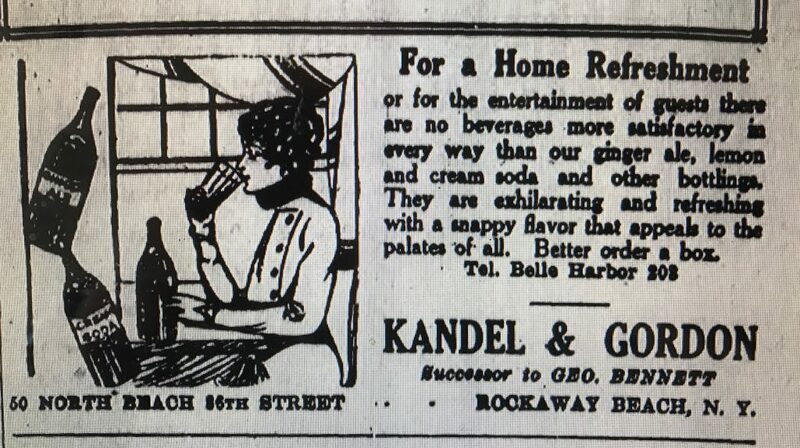 Kandel &Gordon, the successors of George Bennett in the old established bottling and mineral water works propose keeping fully abreast of the times in using appliances and methods which are the latest to be devised in this now important industry, and they are getting into readiness to handle a tremendous business during the coming season. Every indication is that they will be severely taxed despite their extensive facilities, but they propose to make superior goods and dependable service their first and consistant policy no matter what conditions confront them. Their business experience and code of policies assure customers of Kandel & Gordon the best that is obtainable in that line. They were listed in the Brooklyn and Queens section of the 1920 NY Telephone Directory and in the 1922 Copartnership and Corporation Directory for Brooklyn and Queens. Both listed Hammels, Rockaway as their location. Hammels is a section of the Rockaway Peninsula that includes Beach 86th Street. The business was no longer listed in 1924. Advertisements in the Wave during the early twenties mentioned ginger ale, lemon and cream sodas. In August of 1922 they were fined $105. 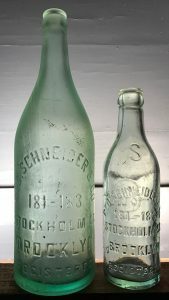 (50 cents per bottle) for using bottles owned by the Schneider Company of 181–183 Stockholm Street. (another bottler found on the bay). My math says K&G were using 210 of their bottles. The system of addresses has apparently changed because there’s no N on any Beach 86th St addresses. I assume the N meant north of Rockaway Beach Blvd. Most of this area today is residential. The most likely location of this business is at the very north end between Beach Channel Drive and Jamaica Bay. I found one 8oz bottle. It’s machine made and that’s consistent with early 20’s manufacture.